When you have very fresh sea scallops, their sweet, succulent taste doesn't need a rich sauce. The trick to keeping scallops moist is to saute them quickly over high heat. Coating them with arrowroot helps form a delectable crisp, brown crust. Remove the scallops from the heat just before they're done, because once off the heat they continue cooking for a minute or two. 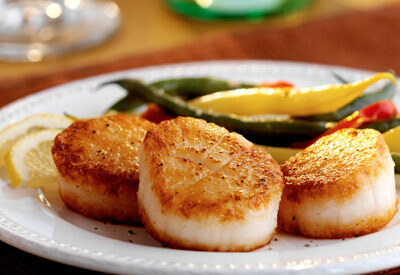 Nestle the scallops in a bed of garlicky sauteed greens for a quick and memorable dinner. Or try them as a starter course with a garnish of string beans and lemon slices. And whenever you serve seafood, use the Seafood Watch Guides from the Monterey Bay Aquarium to make the best choices for your table and for our oceans. Heat the olive oil in a large skillet over medium heat. Add the garlic and cook, stirring constantly, until fragrant, about 2 minutes. Add the baby greens (if all the leaves don't fit into your skillet at first, add more by the handful as they wilt) and sprinkle with 1 tablespoon water. Turn the spinach with tongs until all the leaves are wilted and the garlic is evenly distributed. Season the spinach with salt and pepper to taste. Spoon the greens into the center of a serving platter and cover with aluminum foil to keep warm while you cook the scallops. To cook the scallops: If there is a tough white muscle on the side of any of the scallops, trim it off using a paring knife and discard it. Pat the scallops dry with paper towels. In a separate shallow bowl, add about 1 tablespoon of the spice mixture (or more to taste) to the arrowroot; place in a shallow bowl with the arrowroot and whisk to combine. Dredge the scallops in the spice mixture, shaking off the excess. Pour just enough olive oil in a large, nonstick skillet to thinly coat the bottom. heat the oil over medium heat until it is hot but not smoking. Add the dredged scallops in a single layer, working in batches if needed. Cook the scallops until a brown crust forms on the bottom, 1 to 2 minutes. Turn the scallops with tongs and cook until lightly seared on the other side, about 30 seconds. Immediately transfer the scallops to the platter of greens, arranging them with their crusty sides up, and serve immediately with lemon slices alongside.